A common problem that Fjord owners have is finding a bridle that actually fits. Ypke typically takes an oversize noseband, cob check pieces, a full browband, and pony reins. It isn't easy to find an off the rack bridle that suitably fits her. Often times, I have to mix and match various sizes which means different colors, stitching types, leather qualities, etc. That is where Flexible Fit Equestrian stepped in and kindly sent me their Mix & Match Bridle. This model allows you to select pieces in your desired size and choose from a wide variety of noseband and browband styles — it is like the Build-a-Bear of bridles! Ypke has always had Plain Jane browbands because I have never been able to justify getting her all blinged out. Flexible Fit has over 50 blingy browbands to choose from when you are building a bridle, and I probably spent over half an hour deliberating over what to choose. After consulting several people, I finally chose one. When it arrived, I was blown away by how much it sparkles, even when there isn't direct sunlight. Upon receiving the bridle, I was faced with a completely first world dilemma — styling Ypke's poofy afro to show off the shine. 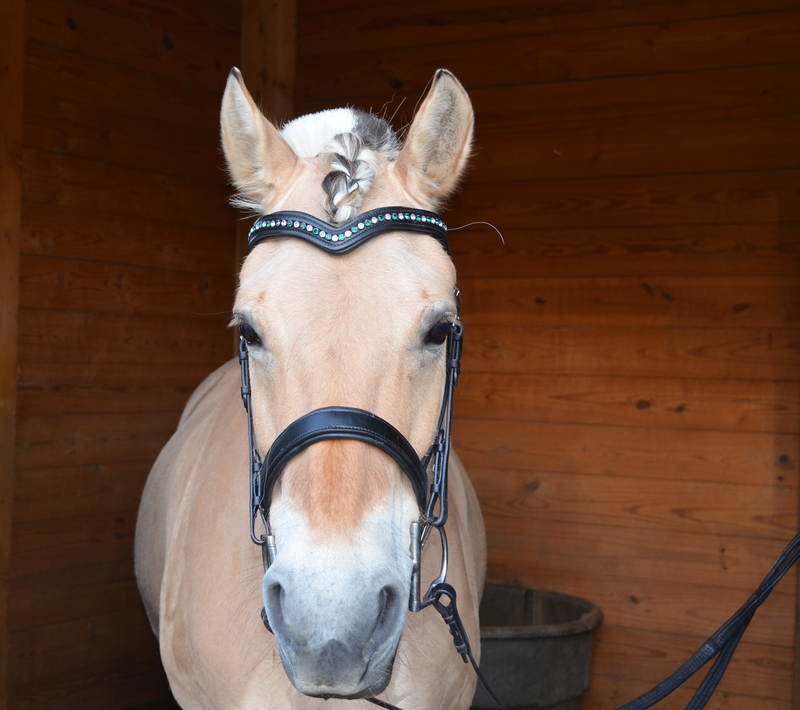 You see, Ypke's typical hairstyle completely defeats the purpose of a blinged out browband. So, I'm turning to you, dear readers, to weigh in on what looks best while still not hiding every last sparkle . Comment whether you think 1, 2, or 3 showcases the Flexible Fit browband sparkle the best. If you are a mad whiz at hairstyling and think the above three are a disgrace, what would you suggest? Oooooh, so sparkly! I would have to go with the braid! Hairstyling has never been my skill, so I can't provide any insight into new suggestions. 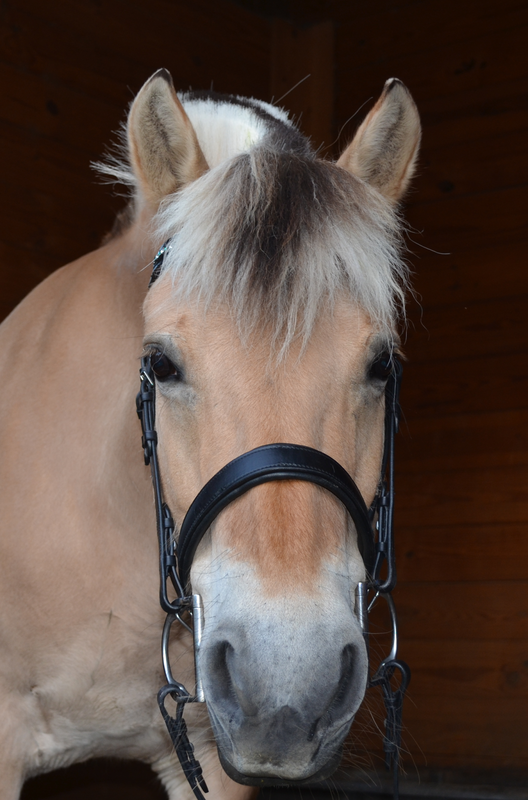 However, I think that the braid looks really cute on Ypke and it shows of the browband quite well. I hear ya! I think so too. Pretty! And I vote braid. Thank you! The braid is probably my choice as well. option #3 ftw. 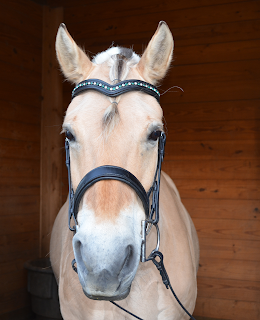 she looks wonderful in that browband! Thanks! I think I will have to stick with bling browbands as opposed to plain from now on! I think we have a winner... That makes 6 votes for the braid! 1 vote for the ponytail! I like the braid! I think it's awesome that you can order bridles with mixed sized pieces. Iw irk for someone who rides mules, and the brow bands are never big enough; her mule with a cob head needs a warmblood brow band. The struggle is definitely real! It is very handy to be able to mix and match the sizes. Haha, she loves to model! I'm thinking the braid too. #3! How's the leather quality on the bridle? It looks lovely! And bling!